The last thing Kelsey Hayes thought she’d be doing this summer was trying to break a 300-year-old Indian curse. With a mysterious white tiger named Ren. Halfway around the world. But that’s exactly what happened. Face-to-face with dark forces, spell- binding magic, and mystical worlds where nothing is what it seems, Kelsey risks everything to piece together an ancient prophecy that could break the curse forever. This is a very hard book to review. You know how sometimes when you like something, but then you can't really put into words why exactly you like it? But then all the things you don't like are really easy to describe? Yeah, that's me right now. I feel like this review might come off extremely negative. 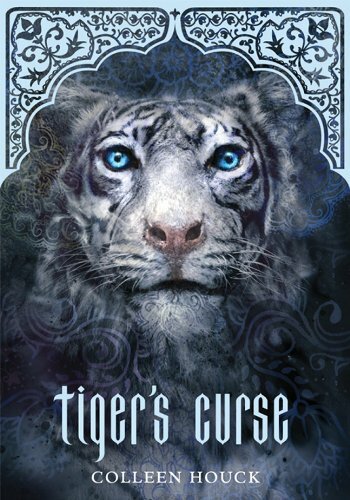 There was something irresistible and compelling about Tiger's Curse, but there were also a lot of things that turned me off . At the same time, I ended this book struggling not to go out and immediately buy the next one in the series. Oh well...I'll just try to put all of my jumbled up feelings into words and let you guys decide whether or not it's worth it. At first, the plot was definitely awkward and relatively unbelievable. I liked the fact that Kelsey was out of high school, because otherwise this entire story line would be bull-crap. There was the whole issue of the circus where the main character Kelsey meets the Tiger Ren. I mean, I know there had to be some reason that Kelsey meets a Tiger, and some reason why she ends up moving to India...but...there was just certain inconsistancies that bugged me. She randomly gets a job at the circus, she is allowed to take care of a Tiger on her own after being part of the circus for 1 hour, she finds a man who says he wants her to come to India with him and just trusts that he is okay...literally, she says "There's something about him that I just instinctively trust." NOT GOOD ENOUGH!!! I'm NOT flying out of the country with a man 3 times my age after I've met him 2 hours ago...sorry...not working for me. The characters were a little on the rough side for the first 3 quarters of the story. There was almost no physical sketch of any of the characters whatsoever. Even Kelsey is only very vaguely described as having brown hair and brown eyes. That's it. Not even something like "chestnut hair" or anything...just brown and brown. I wish I would have had a better idea of what she looks like, because without that description, she just remains this kind of wishy washy image that doesn't really solidify into anything real. And the description failing isn't just physically, but emotional as well. In one minute Kelsey says she feels a certain way, then there is a few pages of plot, then all of the sudden she claims she feels a different way. I felt like Houck was telling me what was happening with the story, rather than showing me. The only time Kelsey had emotions was when they changed, and those were few and far between. It's the difference between being lectured at in school, and experiencing life first hand. Luckily, things got better as the book went along, and I was able to get more personally involved in both the plot and the characters. The cultural aspect and setting of India was absolutely fantastic. I have been making it a point to try and read books where most of the story takes place outside of the US. Sometimes this takes me outside of my comfort zone and into the realms of the unfamiliar and strange...which is totally awesome. I love going to completely unfamiliar places, and experiencing things that I probably never will in this life. There was such amazing descriptions of the bustling cities, the lush jungles, and the crumbling old ruins, I actually feel like I spent a week's vacation in India. I have never heard any type of Indian Mythology or history, so everything was new to me. I can't verify the accuracy of any thing, but I will tell you that it painted a really great picture and kept me interested in the story at times when the characters kind of made me want to put the book down .Also, once Kelsey and Ren got to India, the plot really picked up. They have a ton of things to figure out and codes and puzzles to cypher out in order to break the curse that's been haunting Ren for the last 3 centuries. I give Tiger's Curse 4 out of 5 Keys. It's kind of bordering 3 Keys because it took a long time for me to get into the book. I found myself only able to read a chapter or so before having to put it down. And it was LONG...400 pages doesn't sound like a ton, but it felt like I was reading a 1000 page book. I know it sounds like I hated this book, but I really didn't. Even though I hated what happened relationship wise during the last half, for some reason I ended the book really wanting to find out what happens next. I found myself thinking about the characters and the plot while at work and doing other random house things and I rarely do that once I finish a book unless it stuck with me for some awesome reason. I don't know if the next book is out or not, but I will definitely be checking it out. Great review! I understand what you mean completely. I had a really hard time with the first half of the first book- the time Kelsey spent at the circus was incredibly unbelievable and the characters seemed superficial. (I also didn't like Kelsey much)... but that being said, I enjoyed the second half of the book- the second book is MUCH better and the third book came out the beginning of this month! Can't wait to see what you think about book two- it drew me in and now I am obsessed ha ha ha! Great review. I have heard wonderful things about the second book and how it gets better. The third just came out and I incredibly interested in this series. I have always wanted to go to India and I will one day, but for now, I can totally dig reading a book about it. In my opinion I think that the review is baloney! This lady is obviously a opinionated turtle!! I think that the book is AMAZING! She writes like she hates it and give it 4/5 stars! She is just trying to make the people who love this book not feel as bad. I love this book! I agree that the writing starts off sort of slow, but once you really get into it, it becomes too intriguing to put down and you want to read the entire series right away! I'm still waiting to read the fourth book, but this series have grown to be my fav. I bought this book last year and it's just sitting on my shelf. Your review is making me read it. I just might push it to the top on my TBR shelf.